Yesterday, Saturday May 28th, a gorilla had to be shot at the Cincinnati Zoo because a 4-year-old boy somehow got into the gorilla enclosure, where a 17-year-old, 400-lb. gorilla named Harambe confronted him and began “violently dragging and throwing the child” according to a statement from Cincinnati Fire Department Chief Marc Monahan. 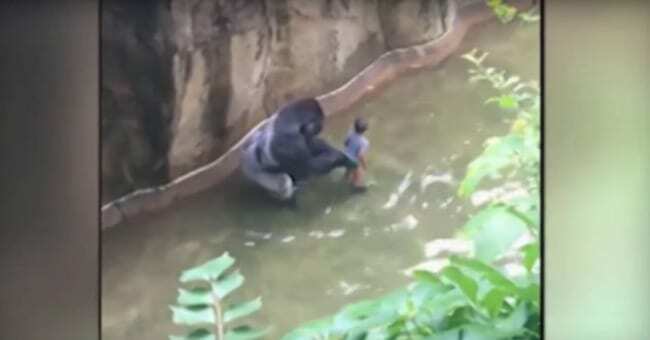 Many people have stormed the Cincinnati Zoo and Botanical Gardens’ Facebook page with irate comments directed toward the parents of the 4-year-old boy, charging that their neglect led to the incident, and the gorilla’s untimely death. My family and I decided to go to the zoo yesterday after visiting my neice at Cincinnati Childrens hospital. For those of you that have already heard, there was a terrible accident there yesterday. And since every news media has covered this story, I don’t feel bad telling our side. This was an accident! ! A terrible accident, but just that! My husband’s voice is the voice talking to the child in one of the videos. I was taking a pic of the female gorilla, when my eldest son yells, “what is he doing? ” I looked down, and to my surprise, there was a small child that had apparently, literally “flopped” over the railing, where there was then about 3 feet of ground that the child quickly crawled through! ! I assumed the woman next to me was the mother, getting ready to grab him until she says, “Whose kid is this? ” None of us actually thought he’d go over the nearly 15 foot drop, but he was crawling so fast through the bushes before myself or husband could grab him, he went over! …the mother was calling for her son. Actually, just prior to him going over, but she couldn’t see him crawling through the bushes! She said “He was right here! I took a pic and his hand was in my back pocket and then gone!” As she could find him nowhere, she lookes to my husband (already over the railing talking to the child) and asks, “Sir, is he wearing green shorts? ” My husband reluctantly had to tell her yes, when she then nearly had a break down! They are both wanting to go over into the 15 foot drop, when I forbade my husband to do so, and attempted to calm the mother by calling 911 and assure her help was on the way. Neither my husband or the mother would have made that jump without breaking something! …the gorilla did just seem to be protective of the child. It wasn’t until the gorilla became agitated because of the nosey, dramatic, helpless crowd; that the gorilla violently ran with the child! And it was very violent; although I think the gorilla was still trying to protect, we’re taking a 400 lb gorilla throwing a 40 lb toddler around! It was horrific! She goes on to give her opinion of the zoo’s decision to shoot Harambe as a means of saving the child. The zoo responded very quickly, clearing the area and attempting to save both the child and the gorilla! The right choice was made. Thank God the child survived with non-life threatening, but serious injuries! This was an open exhibit! Which means the only thing separating you from the gorillas, is a 15 ish foot drop and a moat and some bushes! ! This mother was not negligent and the zoo did an awesome job handling the situation! Especially since that had never happened before! ! Thankful for the zoo and their attempts and my thoughts and prayers goes out to this boy, his mother and his family. I think the people of the Internet are being too quick to judge this boy’s mother, and I’m grateful that Lykins stepped forward. Of course it’s just one person’s eyewitness account, but it sure is a whole lot more information than the media is giving on what really happened. I am hoping more people will share Lykins’ post and spare this mother some of the agony she is surely feeling over the incident and the people of the Internet’s wrath! You can read the details of the incident and the zoo’s statement here, and you can read Lykins’ whole post below. Don’t miss the latest on the Cincinnati Zoo Gorilla Shooting—Read These Next!